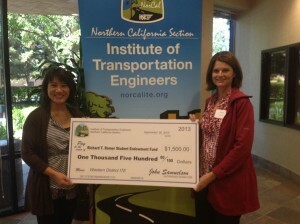 The Northern California Section of ITE (NorCal ITE) is proud to support the Western ITE Richard T. Romer Student Endowment fund. We are strong supporters of our student chapters and continue to seek ways to partner with them to promote our profession and offer opportunities for our future leadership. There are several initiatives that we dedicate resources to each year including sponsoring a student (s) award for an all-expenses paid trip to the Western District Annual Meeting, hosting meetings or webinars with student chapters, and professional mentorship support. This summer, we sponsored Danny Nguyen from California State University, Sacramento (CSUS) to attend the 2013 Western District Annual Meeting in Phoenix, AZ, based on his thoughtful application describing his involvement in ITE and his vision for the future of the transportation profession. We are proud that Danny, along with members of the CSUS ITE Student Chapter applied for and received the James H. Kell student competition award where the Western District awarded them $1500 toward supplies and travel costs to the Annual Meeting. From the two events NorCal ITE holds annually, our Golf Tournament and Vendors’ Night, we dedicate all proceeds from the golf event and all raffle proceeds from Vendors’ Night to the Student Endowment fund. Recently, we were pleased to present a $1500 check toward the Student Endowment fund to District President Karen Aspelin at our September Section meeting. Finally of note, several Northern California Board and Section members are involved in an innovative project with the CSUS Department Chair for Civil Engineering, Kevan Shafizadeh, to provide traffic signal equipment and a fiber connection to the County of Sacramento for a transportation lab to enhance students’ learning experience. We are proud of our talented and motivated students and will continue to support them within our Section and through the Western District’s Student Endowment fund initiatives.